Naturally grown & gently cooked. Suitable for vegetarians.Mackie's thick cut potato crisps are made""from plough to pack""in Scotland... From Farming Roots - In 2009, third generation Perthshire potato farmers, the Taylor family, teamed up with Mackie's of Scotland to create the perfect potato crisp... and here we are today - an award winning family business, satisfying crisp cravings around the globe! Naturally Delicious - Our potatoes are naturally grown and are the best varieties for crisping. Our seasonings, too, are all natural and have been carefully selected to create our range of traditional and Scottish flavours. Tasteable Difference - We take great pride in our unique gentle cooking method, which ensures a great crunch, fresh potato taste and dry texture. So what you'll taste isthe potato crisp - not the oil! Naturally grown & gently cooked. 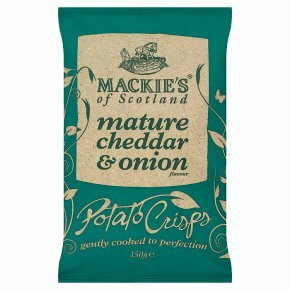 Suitable for vegetarians.Mackie's thick cut potato crisps are made"from plough to pack"in Scotland... From Farming Roots - In 2009, third generation Perthshire potato farmers, the Taylor family, teamed up with Mackie's of Scotland to create the perfect potato crisp... and here we are today - an award winning family business, satisfying crisp cravings around the globe! Naturally Delicious - Our potatoes are naturally grown and are the best varieties for crisping. Our seasonings, too, are all natural and have been carefully selected to create our range of traditional and Scottish flavours. Tasteable Difference - We take great pride in our unique gentle cooking method, which ensures a great crunch, fresh potato taste and dry texture. So what you'll taste isthe potato crisp - not the oil!